Tent heaters have become an essential tool for campers spending time overnight in their camping sites especially during the winter. It provides the necessary warmth that is sure to make winter camping comfortable and exciting. Tent heaters vary in quality and so in price. Without a doubt, the best tent heater go for high prices while those of considerably lower quality go for lower prices. Here, you will find the best tent heater, considering many things. 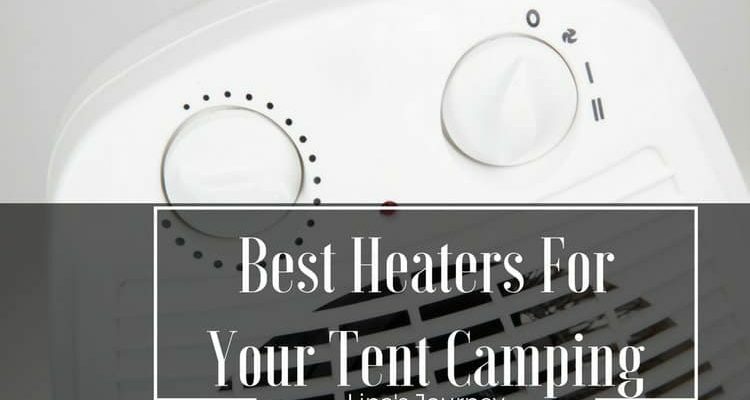 Let's have a look the list that has provided the best tent heaters in categories, from highest of classes to the niche tent heaters. This list has been professionally crafted, from the reviews gathered from passionate campers worldwide. These have been experimented to be the best available and acquisition of such brings forth the desired experience in tent warming. 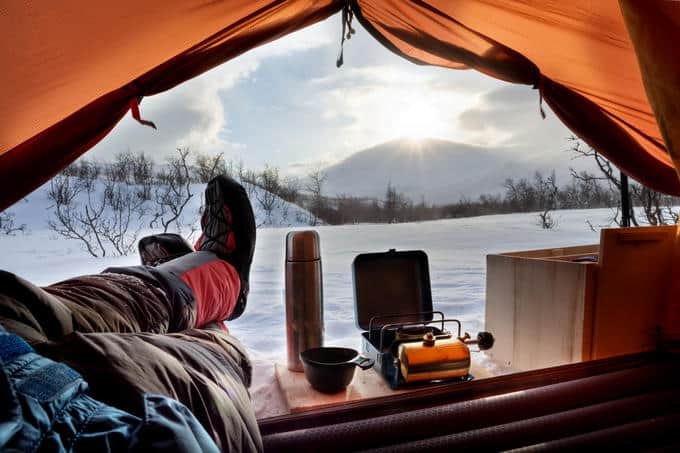 Winter camping is therefore just as enjoyable as when the grass is greener. What Should We Consider When Choosing A Tent Heater? Now let me show you top 4 best heaters for your trip with editor rating. Mr. Heater MH18B is my favorite heater of them all. Mr. Heater is relatively light, its weight is just 11 pounds, making it suitable for travel. The heater also has non-adjustable legs that are made of rubber, making it very stable. The heater has a powerful fan that spreads heat favorable across tents. Mr. Heater MH18B is also suitable for indoor and outdoor use. I like that the heater is free of smoke when burning, and provides an nearly 100-percent efficiency and can heat up to 18,000 BTU/HR for 300 sq. ft., an impressive range. One fantastic feature that you will love the heater shuts off whenever it falls or when the oxygen levels go down. Campers can control temperatures easily by the control knob. However, this heater is restricted to a certain altitude (7,000 FT above sea level) above which it is bound to shut off by itself. It is thus advisable that this heater is used below that altitude. Nearly 100-percent efficiency, can heat up to 18,000 BTU/HR for 300 sq. feet. If by any chance you find that Mr. Heater MH18B does not satisfy your needs, then Mr. Heater F232000 MH9BX Buddy can be a perfect alternative. Mr. Heater F232000 MH9BX Buddy is suitable for campers going to small humid areas. The heater has a fold down handle for campers which makes sure the heater retains minimal footprint while giving it maximum output. Interestingly, with a hose and filter, users can utilize the swivel regulator to effectively switch to a remote gas supply from a disposable cylinder. However, this heater is not able to operate over 7000 ft. above sea level and goes off when it detects low oxygen levels or falls. This feature will impress you as it is a safety precaution to prevent further damage to the heater. Apart from tents, Mr. Heater F232000 MH9BX Buddy is also suitable for heating small conference rooms and workshops. Lasko CD09250 Ceramic Heater is sure to impress campers who are low on cash. This heater has very many impressive features even though it comes out relatively cheap. Lasko CD09250 Ceramic Heater is very portable, it is very lightweight, just 3.5 pounds. I find this tent heater suitable for enclosed places of a limited perimeter effectively and stands out as one of the most used tent heaters by campers. It is mostly used for an emergency heater as it becomes of handy in most emergency cases. Safety standards are kept too by the availability of a safety shut off which takes effect when there is a significant pressure change. With automatic shut-off if it overheats, I feel safe when heating my tent at night. Lasko CD09250 Ceramic Heater is a small heater but strong power that can adapt our expectation with good price. This is one of my favorite heaters. When money is no major option, you’re going to want the very best when it comes to your heater. With that in mind, look no further than the Dyna-Glo IR30PMDG-1. The heater has been built by the latest infrared technology; you will, therefore, appreciate how efficiently it heats up a tent. I really impressed with its efficiency, up to 30,000 BTU/hour. What cuts it out for me with this tent is that it does not require electricity to operate yet burn with the same intensity as those using electricity. With this advantageous feature, Dyna-Glo IR30PMDG-1 becomes an excellent selection for heating when camping far in the woods where there is no electricity. This tent heater is therefore environmentally friendly as it runs on propane which emits harmless heat. Dyna-Glo IR30PMDG-1 can heat up a considerably larger perimeter (1000 sq. ft.) economically and is also suitable for emergency heating of homes, garages, and cabins. Mr. Heater F215100 MH4B Little Buddy is an indoor safe propane heater suitable for spaces of up to 95 sq. ft. The heater is very simple for campers, with an on and off system that makes it easy for you to use. Just as other preceding tent heaters, Mr. Heater F215100 MH4B Little Buddy has safety features to prevent further damages to it in case of emergencies when you are camping. Such is the availability of switches that turn off when the heater tips off or when low oxygen level is detected. The heater can serve you for at most five and a half hours, spreading heat free of odor at all times. It can also be used in many of your other setups such as cabins, garages, and porches. Finally, Mr. Heater F215100 MH4B Little Buddy has a 3,800BTU/hr heat setting that allows you to control your comfort level. Patton PUH680-N-U Milkhouse Utility Heater is ideal for open heat areas such as workshops, tent, basements, and garages. You will fall in love with its outstanding design and its rugged steel housing. I like how you can regulate heat regulation from one area to another, with its comfort control thermostat. Patton house utility heater is ideal for areas where there is a need for constant airflow and ventilation. Such are the setups aforementioned. The knobs are easy to control, allowing the user to maintain the required heat level in all instances. You will not have to worry about the heater breaking if it falls, the Patton Milkhouse Utility Heater has front guards to protect it in case it falls. The heater may thus fall on hard surfaces yet still be intact. What attracts me to this heater, however, is that it can go off automatically in case it tips over, proving very safe indeed. Campers will also love how the heater is portable and safe when carrying, all possible because of its handles. If you want to feel instant heat immediately you walk into your tent from the cold; then the Comfort Zone CZ460BK Motion Sensor Ceramic Heater is the heater you deserve. The Comfort Zone CZ460BK Motion Sensor Ceramic Heater is one of the most technologically advanced heaters of the 21st century, with a motion sensor that goes on and off when you walk in and out of the setting. The Comfort Zone CZ460BK heater provides utmost satisfaction in heating. What more could you ask for in comfort? You can also operate The Comfort Zone CZ460BK with or without the sensor. The heater uses little power and is thus less likely to cause you power disruptions when in use; it has a minimal hi/low wattage. You have to appreciate its motion sensor feature, which enables the heater to turn off after 30 minutes when it detects no movement around. It comes on immediately on at the slightest detection of motion. Faultiness in the motion feature is not frequently reported, and it has been discovered that faultiness comes when you allow the heater to fall one too many times, and not because of manufacturer’s faults. Should the heater not detect motion for two hours, it permanently shuts off. The heater is made of a cool housing and can detect overheating and thus turn off at its onset. You will love how light it is, just 2 pounds. TMS Portable Military Camping Wood Stove is an ideal cooking stove for campers. Its ability to heat your food sufficiently is incredibly fantastic. Apart from that, you will be able to heat places around you just like a regular tent heater. For campers pitching up a tent around the lake, this is a perfect fit. Cooking has never been better with TMS Portable Military Camping Wood Stove. I find this kitchen stove is safer than having an open fire. The TMS Portable Military Camping Wood Stove has great folds that provide a flat heating surface. This heater is portable and durable. Also, the heater has rear air regulators, and you can access its bottom easily when cleaning. Among the tools that accompany the stove is a stove pipe. It has a heavy steel construction, and you can use its top grate when the stove is not in use. The stove has extension legs for improved stability. However, when indoors, you must install and ventilate the stove correctly. Camping Emergency Butane Heater is sure to impress campers who are low on cash, and for impromptu camping trips especially in the middle of the month. This heater has very many impressive features even though it comes out relatively cheap. 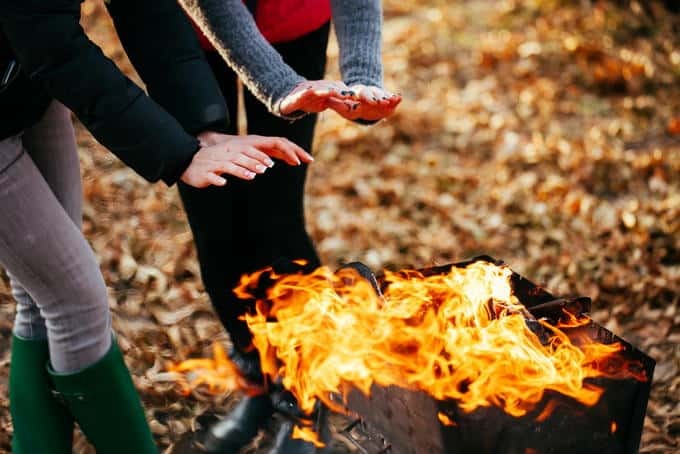 Camping emergency butane heater is very portable, and people with lots of kids can benefit greatly from it. It is designed with a cartridge compartment that only adds up to its portability. I love that the heater uses propane, and is a double coherent source. This utility ensures the heat emitted is free of any toxic substances. It is favorably excellent in gas consumption with an intake of 100gm/hr. Its weight certainly helps a lot (5.4 pounds) - this is very light and makes the heater portable. This kind of tent heater can be carried on back packs in the same regard. The 32-pound Broan-NuTone 6201 Big Heat Heater is highly durable, with rugged steel and durable finish and I recommend it if you want to spend some time in the open, small tents and workshops preferably. The heater comes with a safety shut off feature that goes off instantly when you accidentally tip-off the heater, preventing further damage. You, therefore, don’t have to worry too much when the heater falls accidentally. In case of overheating, the overheat protection shuts off the heater, and the caution light instantly signals you of the excess heat. This feature contributes to its durability. Additionally, with the fan-only option, you can operate the fan to cool the area, disabling its heating capabilities. For you to get the required temperature at the setups, the heater possesses a thermostat control. Its handle is also well designed for you to provide balance holding, and its surface is protected by the bumpers placed. Adding also to its durability is the stainless steel material that makes it, and therefore you do not have to worry about rust. You cannot always carry all of your stuff while going on a hike. Lots of luggage, in any case, will make you tire quickly and in the long run slow you down. You should always, therefore, consider the size of the heater before you set out on a hike. With big heaters you will always be taking multiple breaks to take a breather, small heaters however just offer the opposite experience. Just as the size dictates, heavy heaters will slow you down. I prefer light heaters when I go out on a hike. Heavy heaters will always just slow you down. Different types of heaters consume various types of fuel. Try being economical by choosing what is easily available and goes for lower prices. When you buy a heater, you expect that it will serve its purpose adequately and with great enjoyment. Heaters have different levels of efficiency; it is therefore only prudent that you go for what will work best to keep you and your family warm in the cold winter. Heaters are known to use a high voltage and may at times cause power disruptions. Campers have found heaters which do not use electricity as a perfect replacement for this defect showed by electric heaters. These heaters provided just the required amount of heat for campers. Though mostly used in emergencies or when there is no electricity in the camping areas, non-electric tent heaters are also convenient when used in place of electric heaters as the utilities are the same. There are many ways of heating up a tent without electricity. Use of non-electric tent heaters stands out as the best way to do so. Mr. Heater MH18B clearly crosses the finish line first.This heater as I have mentioned is light and easy to pack therefore making it suitable for travel. The heater is also durable than the other heaters and it is also very stable. I also found a good video to check out when finding good tips for clean my heater. It is the following video from Mr. Heater chanel on YouTube. Camping without tent heaters is not a common doing among campers. One must at all times be accompanied by heaters when camping especially in cold or humid areas. These tools of the trade are very essential. The list crafted guides through the purchase of the best tent heaters. This list is designed by the best for the best. Did you find it exciting and educative? Please leave your comment and share with friends and family looking to get the best heaters for the best camping experience.